There never was any doubt that Floyd Mayweather Jr. would beat Andre Berto, not before they stepped in the ring and not while they swapped punches. That swapping almost exclusively consisted of Mayweather landing at will and Berto being made to miss nearly everything he threw. And that reality led to Mayweather ending his remarkable career with a wide unanimous decision victory over Berto, one more win to add to an undefeated record that now reads 49-0 with 26 knockouts. Mayweather shut Berto down from the outset, establishing distance with jabs, making him reset by changing directions, and keeping him aware of the threat of left hook or right hand leads. Mayweather had little difficulty dodging or blocking Berto’s offense, and when he needed a rest or things got too uncomfortable he also could clinch and hold. In other words, it was the typical Mayweather performance. If Manny Pacquiao couldn’t solve him, then Berto never was going to stand a chance. There wasn’t much suspense, nor were there many highlight moments. 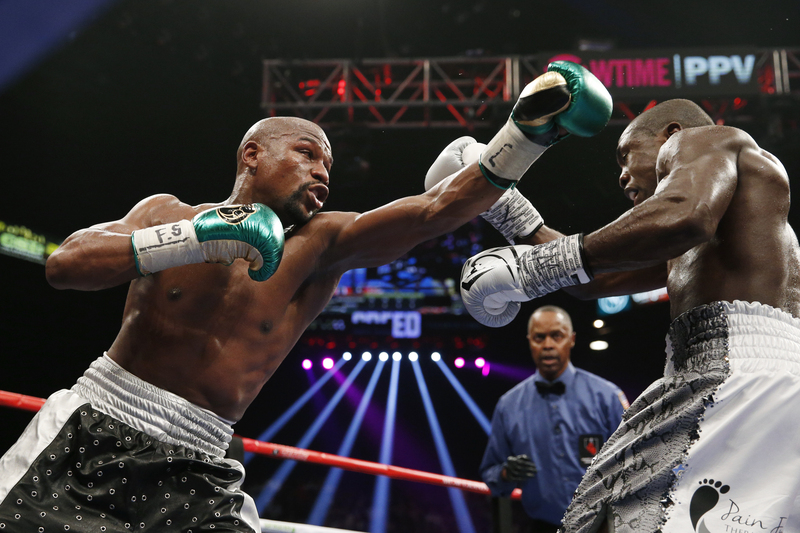 Mayweather had a right hand in the fourth that looked as if it momentarily hurt Berto. He opened up with more sustained offense in the sixth and also in the 12th. Berto became frustrated enough with how the fight was going that he pushed Mayweather from behind toward the end of the ninth. And the jawing between the two became so heated that the referee paused the fight and admonished them in the 10th. The rest of the time was just a master at work. Mayweather landed 232 punches, connecting a remarkable 57 percent of the time. Berto was limited to landing just 83 punches on the entire night, hitting Mayweather with just 17 percent of what he threw. 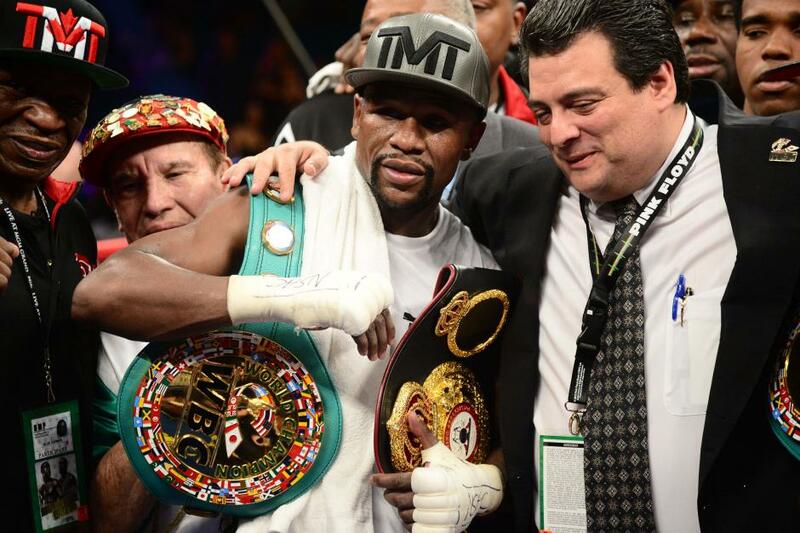 Mayweather didn’t drop Berto or beat him down the way Victor Ortiz, Robert Guerrero and Jesus Soto-Karass had. He didn’t need to. He was there to win how he prefers to win, picking his spots for his shots and keeping from taking much of anything in return. That wasn’t about to change for his final fight, not even with an opponent who was there to be hit. The scorecards were a 120-108 shutout from one judge and the other two judges somehow finding two and three rounds to give to Berto, respectively, scoring it 118-110 and 117-111. Berto got a career-high payday out of the loss. He hasn’t been a top welterweight for years, but he’ll remain around the 147-pound division until another significant loss. That won’t be the consequence of this past Saturday. He lost to Floyd Mayweather Jr. after all, just like everyone else has. The night didn’t start well for Jonathan Oquendo but it ended much better, as he rose from an early knockdown and battled his way to a close victory over Jhonny Gonzalez in a 130-pound fight. Gonzalez was coming off a devastating loss but was a former titleholder at 118 and 126 pounds. He showed that some talent and power remained, scoring a knockdown in the first round with a right hand that was followed by a left uppercut. Oquendo got up and fired back, and in the second he returned the favor, landing a right hand that put Gonzalez on the mat. Oquendo tried to finish Gonzalez but was unable to do so. 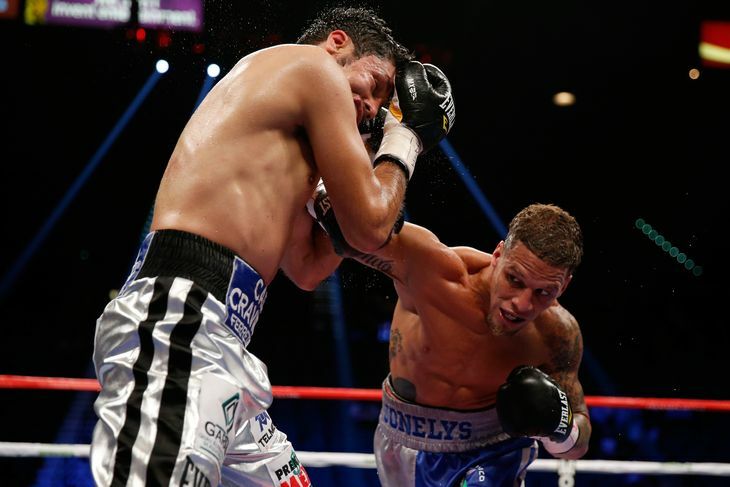 Gonzalez walked to the wrong corner at the end of the round but was able to steady himself as the action continued. It was a give-and-take kind of fight, one in which each refused to receive without responding. Each targeted the other’s body, seeking to wear him down and grind out the win as exhaustion and damage set in. Oquendo came out on top via majority decision, one judge having it a 94-94 draw, another seeing it closer for Oquendo at 95-93, and the third having Oquendo ahead by a ridiculously wide margin of 98-90. Both had desperately needed the victory. Oquendo scored the biggest win of a career that had included losses when he’d stepped up against Juan Manuel Lopez, Wilfredo Vazquez Jr. and Abner Mares. Gonzalez, who was blown away by Gary Russell Jr. earlier this year, now has lost two of his last three. This one may hurt even worse than the defeat to Russell. He showed competitive fire against Oquendo yet will need more than that if he hopes to contend again. Ishe Smith felt the first knockdown Vanes Martirosyan scored on him shouldn’t have counted. Smith knew the second knockdown was the result of a silly mistake. 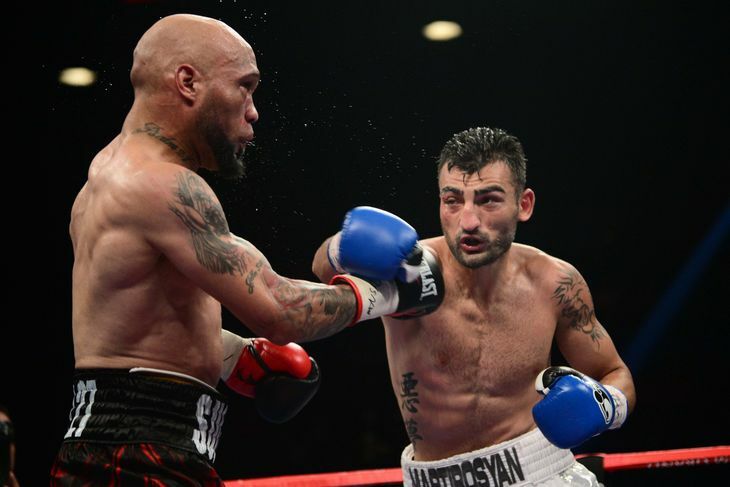 Both of those wound up being crucial moments, providing the deciding points on the scorecards and helping Martirosyan leave with a majority decision victory. The first knockdown came in the third round, when Martirosyan threw a right hand and Smith ducked down and forward. The punch landed behind Smith’s head while he was off-balance, and he fell forward. Smith protested the call, to no avail. Smith had been fighting well beforehand and showed even more urgency as the fight heated up. Both men needed good performances in order to get another chance in the 154-pound division. Smith needed to make up for the knockdown and sought to curry favor in the judge’s eyes during what often were competitive rounds. Toward the end of the eighth Smith admittedly got desperate, throwing wide punches to Martirosyan’s body and head but receiving a sharp, straight one-two counter in return. Smith stumbled backward and down. Had those knockdowns not happened, and had the judges given Smith those rounds, then the fight would’ve been a draw. Martirosyan should benefit from the win. He’d fallen short of victory in big fights before, leaving with a technical draw in a cut-shortened bout against Erislandy Lara in 2012, dropping a split decision to Demetrius Andrade in a title fight in 2013 and losing to Jermell Charlo on the cards earlier this year. It wouldn’t be surprising to see him move on to a title fight against Charlo’s brother, Jermall, who won a world title on the same day as Martirosyan-Smith by blasting through Cornelius Bundrage. Martirosyan also could end up in rematches with Jermell Charlo or Lara, or he could face fellow contenders Austin Trout or Julian Williams. Smith briefly held a title himself after beating Bundrage in 2013 but lost it one fight later. Even though he’s been on the losing end against a number of recognizable names, he shouldn’t be consigned to off-television fights just yet. He performed decently in this defeat and could get another chance against another prospect or contender soon.